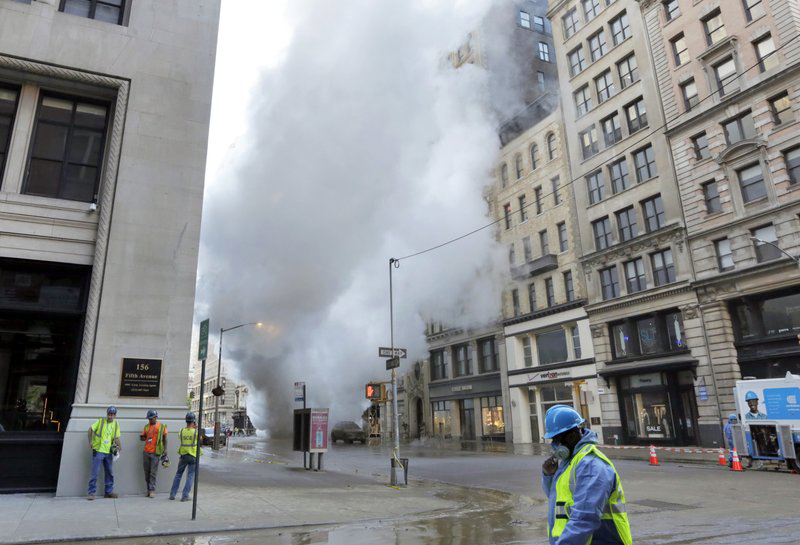 A nearly century-old steam pipe exploded beneath Fifth Avenue in Manhattan early Thursday, hurling chunks of asphalt, sending a geyser of white vapor 10 stories into the air and forcing the evacuation of 28 buildings. [post_ads]Five people, including three civilians, suffered minor injuries from the 6:40 a.m. blast on 21st Street, and officials warned people who may have gotten material on them to bag their clothes and shower immediately as a precaution because of the possibility of cancer-causing asbestos. “The big problem we have to consider is asbestos,” said Office of Emergency Management Commissioner Joseph Esposito, who warned that if asbestos is confirmed at the scene, the cleanup could take days. On a street near the blast site, firefighters stripped off their heavy outerwear, bagged it and entered a red decontamination tent in their gym shorts and t-shirts to take showers. Responders’ vehicles were hosed off. The cause of the blast was not immediately determined. No work was being done on the pipe at the time. “Everyone — including the police and firefighters who were standing by — started moving back,” he said. Similar explosions over the year have drawn attention to the aging infrastructure beneath the streets of the nation’s largest city. Fire Commissioner Daniel Nigro said the pipe that blew was installed in 1932. More than 100 miles of steam pipe run beneath Manhattan, delivering vapor that powers heating and cooling systems in thousands of buildings, among other functions. The pipes share the crowded underground with subway and commuter rail tunnels, telecommunications and electric cable, and water pipes.